52-page giant. Cover by Nick Cardy. "Who Is Clark Kent's Killer and Why Is He Doing Those Terrible Things to Me? 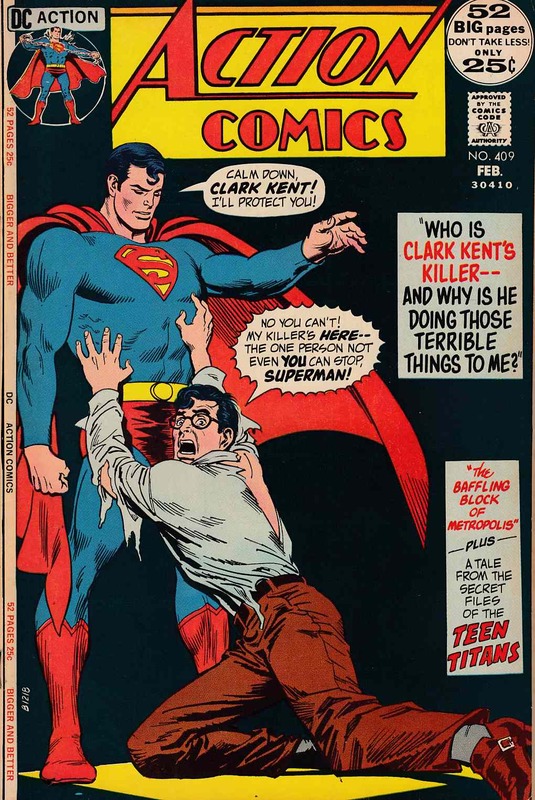 ", script by Cary Bates, pencils by Curt Swan, inks by Murphy Anderson; A would-be detective from another world tries to help Superman discover who is secretly trying to kill Clark Kent, only to learn that Superman is doing it himself, thanks to a personality split caused by not getting enough sleep. Classic reprint, "The Secret Olympic Heroes," script by Bob Haney, art by Nick Cardy; Speedy joins the Teen Titans. "The Baffling Block of Metropolis," script by Cary Bates, pencils by George Tuska, inks by Murphy Anderson; Origin of the door to the Fortress of Solitude. *Grading Notes: light foxing along edge of back cover.